The market is always full of challenges and hurdles and if you are a newcomer, making an entry in the market is not an easy task. As soon as you step into the world of search engines, you have to face an encounter with the first big hurdle’’ called sandbox” and you have to stay there until you are regarded mature enough to be allowed enter the top ranking club. The situation seems more difficult when you find that there is no direct confirmation of the existence of a sandbox. There is nothing like an exact location like it and Google also not gives a clear statement in this relation, yet the online marketing experts have seen in practice that even the new site is highly optimized, cannot achieve higher rankings in Google search engine research page, while it is quite easy with other sites such as Yahoo and MSN. In the case of Google, this detention period is average 6 months; the newer sites may have to stay here from one month to over 8 months. At a first look, anyone can feel the practice of stopping the newer sites by nongenuine methods, quite unfair. But, if see the issue with the Google’s aspect there are some good reasons for resorting to such measures to keeping these newbies at the bottom of the search engine. There are many black hat practice that has a newly creates website can follow for getting a coveted top position such as, purchase of links in bulk, copying the content or duplication, improper keyword stuffing. These activities simply result in a huge number of backlinks overnight and are against the guidelines by Google. Obviously, Google will penalize them. To discourage these fake sites and their artificial efforts to get indexed and admitted to the top position, Google had to take measures for ensuring that such actions are completely unacceptable. The sandbox stay works quite similar to a probation period for the newly launched sites to focus the site owners on the long-term quality measures for getting higher rank in Google searches. Though aging delay is deemed to have the similar meaning to a sandbox and most of the SEO professionals apply them interchangeably; they have enough difference. It is observed in many cases that there are many sites listed at the same date, but due to aging delay their expiry period comes in different months or even in different years. Here, a thing is very essential to mention that the sandboxes are undoubtedly beyond your control and it is not easy to avoid it, there are some tricks or methods you can apply to minimize the damage to a new site with new domains. 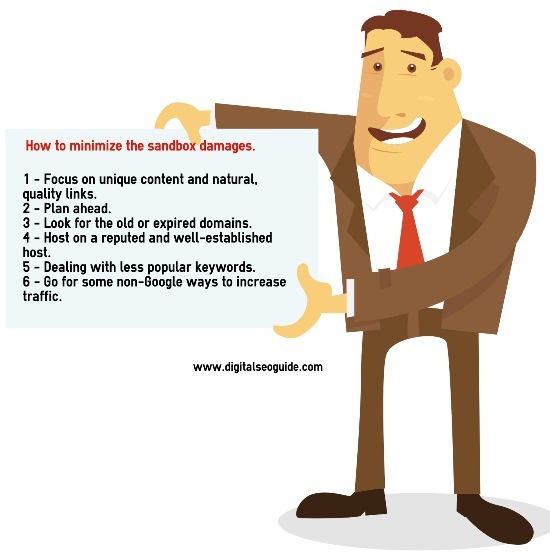 It’s true that Google sandbox is something you cannot control over, the SEO experts have successfully discovered few steps, that one can use to effectively minimize the destructive influence of Google sandbox on a newly launched site. While all the online practices can be subjected to ethical and unethical practices and going with unethical practices can cause you additional penalties or a complete ban from Google, so you should use them with complete alertness and cautiousness. Before going further about revealing the tricks and techniques that can help you I minimizing the Google sandbox damage, make up your mind for an established fact that “no one can win against the sandbox”. You can just make an effort to get adapted to it and keep patience until the detention period is passed. Never think about Fooling Google search spiders and using the “sandbox tools” to bypass filter, this will only result dangerous to your site. It will surely take some time, but till the sandbox period passes, actively gather the relevant and fresh content and organic links as they will boost your position to the top. While in the process of getting links, be sure to follow the trusted sources such as DMOZ, CNN, Jasmine Directory, Fortune 500 sites and other sources. It is also suggested to get links from the .edu, .gov, .mil domains because these are generally exempted from sandbox filters. And never run for 1000 links per month. Go slow and steady. Be smart while launching your website. Usually, people follow the general practice when it is absolutely complete. But if you launch it in its designing stage, you can keep a balance between the time of its development and passing of the sandbox period. While Sandbox effect specifically works over the newly launched sites on the new domains, you can buy any old or expire domain for launching your site there. It will significantly reduce your problems. As one other option to reduce the sandbox influence, you can host your site on a subdomain of a well-established host. But be careful as many SEO experts don’t take it as an SEO ranking friendly idea. Hosting the main site on a subdomain also can be practiced. One more solution is to use redirects from the sub-domain site to the new one. The impact and effectiveness of this method are still a matter of discussion because of not used properly, it seems like an attempt to make Google a fool. Though your site is staying at the sandbox, still your site is indexed by Google and working on it. So it is quite possible that you will be at the top of the search results from the starting point. How? Find out the less popular keywords and get the top position in this field. Simply, better than nothing. This is the time when you are waiting for higher ranks for your highly lucrative keywords, you can work with some less popular keywords and keep your ball rolling on. Of course, you will need some optimizing efforts for it. Yes, Google is a leading name in SERPs, yet it is not the only one. While making your SEO strategy, also consider and involve other search engines and marketing tools with no sandbox limitation at all or relatively short period of detention like situation. It will definitely help you to jump over the Google sandbox influence on your online promotion plans. According to me, these all are the best idea about the possible initiatives, one can take while in the Google sandbox effect. Let us know if you have questions or recommendations. Thank you for reading.